Today is International Women's Day—and March is Women's History Month—so this month we'll be bringing you posts about women in the field service industry. 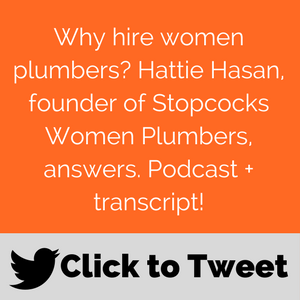 We were thrilled to be able to interview Hattie Hasan, founder of Stopcocks Women Plumbers, for a podcast about how she got into the business, why many customers prefer to hire female plumbers, and their biggest challenges in the industry. Listen to the podcast here—or if you're more of the reading type, you can read the entire transcript below. And if you'd like to send in your story of being a female in the traditionally male-dominated field services, please email us at linda.formichelli@commusoft.co.uk. Commusoft: Hi, this is Linda Formichelli, Inbound Content Manager for Commusoft, and I'm here with Hattie Hasan, founder of Stopcocks Women Plumbers. From 1990 to 2016, Stopcocks has grown from one woman and her vision into a national company showcasing excellent women plumbers. And in March 2017, Stopcocks Women Plumbers launched as a national franchise. Thanks so much for being here, Hattie. Commusoft: So, can you give us a little background? I know you started out as a primary school teacher. How did you get into plumbing? Hasan: When I was at school, I was interested in doing engineering and metalwork and woodwork as further study. And I was told—in the 70s, this was—that those subjects were not available to girls. I was directed towards cookery and needlework, so that's what I did. But then, when I wanted to leave teaching and do something else and self-direct my life, I looked back at my earlier dreams of metalwork and engineering. I coupled that with my love of water, and really, it had to be plumbing. So that's what I did. Commusoft: When was it that that you decided to go into plumbing? Hasan: In 1989, I decided I was going to leave teaching, and I spent that year trying to find what I was going to do. It was 1990 when I started plumbing. Commusoft: I saw in your bio that around that time, your attempts to gain employment were not looked upon favourably by the fraternity of plumbers. How did you overcome that? Commusoft: Good for you! I saw you started Stopcocks in 1990. We'll talk about your book later, but as I was flipping through it I saw the Stopcocks flyer you made. What was the reaction to that? Hasan: It took a little bit of time to get going. I had a second-hand answering machine that I bought, and I sort of sat and watched it for a couple of weeks. It was a bit of a slow burn, but eventually people started to call my number. One of the other ways I got work was I went into a local magazine and I asked them if they needed any plumbing. They did feature adverts in them. I couldn't afford an advert in a magazine, but I went into the magazine and I asked them if they needed any plumbing—and as luck would have it, they did need some. So I said I would swap the plumbing for a small ad in their magazine, which they did. Commusoft: That's a great idea. If you don't mind if I go back a little bit, how did you learn the plumbing trade, since when you were in school they shuttled you into cooking and needlework? Hasan: Well, I went to college one day a week for three and a half years, and as soon as I learned something I basically sold it as a service to customers. Commusoft: Do you remember your first plumbing job? Hasan: I do, I do. It was plumbing in a washing machine. I was actually doing something else in the house for this customer and they said to me, 'Can you plumb in the washing machine?' I was quite nervous because I'd been doing college, but I'd not actually done plumbing. I hadn't built up my confidence to sell my plumbing work as yet. When they said to me, 'Can you fit the washing machine?' I said, 'Sure!' I gave it a go, and I basically should have had more faith in myself. I knew more than I believed I knew. Commusoft: Did that experience teach you that you should have more confidence going forward? Hasan: It did. It encouraged me to push the boundary ever so slightly. I moved from 'I don't know how to do it' to 'Well, actually, it's only a combination of two or three things that I do know how to do.' And when you put them together, you manage to get the whole. That's how, basically, I built my entire business, just building on what I'd already learned. Commusoft: So were you doing plumbing full-time until last year when you launched your franchise? Mainly they thought they could trust a woman more than they could a man. I started thinking that there's an opportunity here, and not just for myself. You see, I was realizing my own opportunity, but I was also seeing the possibilities for other women because I had hardly met any other women plumbers in the whole time I was plumbing. I thought there must be more to it—I can't be the only one. Commusoft: I have to ask: When you got that comment about people seeing female plumbers as more trustworthy, were you getting that from male and female customers? Hasan: Oh, yes. I was getting it from everywhere, really. Commusoft: Wow. Then, was it in 2007 that you went from a one-person business to more of an organisation? Hasan: Yes. What happened was, I started to look at the wider implications—and also by that time, I had a website and an email address and people were starting to contact me asking me about how they could become a plumber. This was great because that was what I wanted. I stood in front of a group of entrepreneurs and said that I was going to build an army of women plumbers because I wanted to solve (A) the problems within the industry and why there weren't more women, and (B) the problems of the world and water. I spent from that time right up until about 2010 really, really delving into the industry, the training, all the ins and outs of it, and finding other women that were plumbing. I did start an online community as well. I used to send a monthly newsletter out to any woman I found who had an email address who was a plumber. I'd go and interview them, pretty much what we're doing here. When it was easier to put videos on, I started video interviewing other female plumbers. I wanted to create a community. It was still just me, however, a plumber on my own, until I really knew how the community ticked and what the issues were for other women. I then decided that I wanted to bring them together and create the company. So I spent from about 2010 to about 2015 bringing other women onto the Stopcocks brand as a license to try and see if it worked. I found it did. Commusoft: So that was 2010 to 2015, and then in 2017, you launched the national franchise. How did that happen, and how has that been going? Hasan: It's been an amazing journey. I mean, we must be on about mark five now because we've come and gone in so many different ways. When I first started having the idea, I sat down and made a list of all the things that would make it easy for somebody to go out and be a plumber. Basically, there were 20 things I thought I had to provide for people, and nobody would want to pay for that service because it would be ridiculously expensive. So I did that for bit, and then I honed it back. I settled on three key things, which were brand, mentoring, and quality of plumbing. Once I settled on those three things, I found that that was something that I could deliver. I started to attract women who wanted to work under the Stopcocks brand, which was great. But it wasn't a franchise—it was basically the test bed. We tested this, that, and the other techniques and grew the model. I had brought my colleague, Mica, into the company as well, and when we believed we had a model that was sustainable and could grow, that was when we launched as a franchise. It's been going amazing. 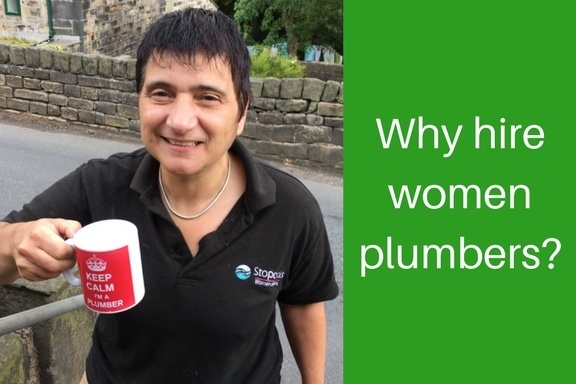 Our plumbers are really incredible women building successful businesses. Commusoft: That's great. So what does Stopcocks Women Plumbers look like today? Hasan: Well, it's a very small core group, and that includes myself. Every single plumber that comes into our sites, I meet personally or talk to personally. I've always said that I wanted to do that. I even wrote in my book that when we start and grow Stopcocks, I'll meet every single one of you. I imagined that one day, there'd be thousands of women plumbers and I'd meet every single one of them. Hasan: We're not near the thousands yet, but one of the things launching as a franchise has really done for us is that it's given us a profile within the industry. Whenever anybody wants to know anything about female plumbers or getting into plumbing, if they're a woman, then we are the first people they call. So we get calls from colleges. We get calls from parents whose daughters want to be plumbers. We get calls from women who want to train to be plumbers and want to know how to go about it. We get calls from women who are in training and want to know what the next steps can be. And we get calls from industry as to how they can attract more women. So the profile actually has been really brilliant for us because it's meant that last year we were able to host an event in central London, which was the largest gathering of female installers ever, really. Commusoft: Do you know what percentage of UK plumbers are women at this point, and if that number is going up? Hasan: Well, there's a number that's bandied about. It's not really counted. One of our campaigns that I've been going on about for about a year has been, can we please count how many women there are? We have received some resistance from the institutions, and I think it's because they want to attract more women in. There are numbers available of how many women we've trained. But we can't necessarily find the self-employed ones because there's no way to count them. So one of the campaigns I've been banging on about has been, how do we count them? And just yesterday, I received an email from the Gas Safe Register. I met with them last week and put this to them, and then yesterday I received an email saying that they knew that there were 500 registered gas engineers who were female. Now, that's just gas engineers. Then we've got plumbers. Probably about 1% of plumbers are women. So it's tiny. Commusoft: You mentioned earlier that you held an event in London. Are there any other events that you hold for your franchisees or your organisation members? Hasan: Yes. Well, our franchisees, we get together once every couple of months because I believe it's so important to. The fact of the franchise is that you're self-employed but you're not alone, and we all get great strength and support from each other. Not only do they get that from me, but I get it from them and they get it from each other. We used to get together every month, but that became unsustainable. We're going to build it back up again to every couple of months, because I feel like I miss them and as they're building their businesses they need me less and less. Commusoft: That a good thing, right? Hasan: It's a great thing, but I actually think, okay, so they don't need me for mentoring on the business side of it—but they still do need the community because they're so isolated. MORE READING: "Empowering Women in the Mechanical Industry", by Kelly Faloon in Contractor magazine. Commusoft: You mentioned that the industry is now looking to attract female plumbers. What's the biggest struggle women plumbers are having today? Hasan: That's a very interesting question, because if you talk to any manufacturer or any supplier they'll say to you that there's no problem. 'We see no problem about having women in our industry.' But the majority of companies that would take women are still—and I choose the word exactly as I see it—one-man bands. So it would require a man who has a couple of employees to employ a female, and because there are so many trainees out there, there is a choice of male and female but it's often the male that gets chosen. So it's a numbers game. There are so few women that it's difficult for them to get chosen. If they want to gain experience they need to get employment, and the only way they can get employment is by the larger employers like British Gas and a lot of housing associations. I was recently on a board that was to do with best practices and getting more women into the maintenance sector of social housing. So basically, employing women to maintain the social housing. A very, very successful campaign has been run and we now are in touch with several housing associations so that when women come to us we have places to signpost them to, so that they can get employment and gain experience. We're helping in that way even though that's not directly bringing those women to us. It is putting them into the industry. Commusoft: Right, and that's part of your mission, isn't it? Hasan: Absolutely. Obviously, we do have a business to run, but there are many ways of doing that, and building our profile is one of them, and through our events. The last one was so successful, we're going to be running another one on July the 4th with a theme of independence. Commusoft: You mentioned earlier that you discovered early on in your career that people liked hiring female plumbers because they found them more trustworthy. Is there any other reason that people might prefer to hire female plumbers? Commusoft: Right. And is this coming from male and female customers or mostly females? Hasan: It's mostly females, to be honest, yes. But it does come from my male customers also. I've often stood and chatted with a male customer, and he's said, 'Well, I really don't want a man coming in the house making me feel useless, and making me feel like I should know how to do this stuff.' So yeah, they don't want to feel threatened either. Commusoft: Let's talk about your book. 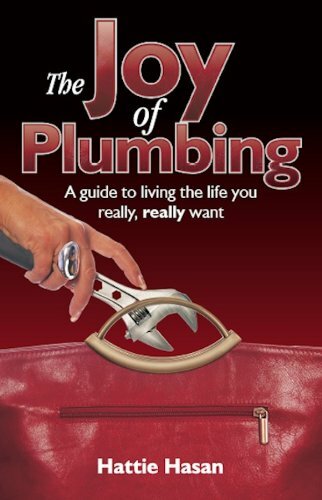 You have a book called The Joy of Plumbing: A Guide to Having the Life You Really, Really Want, that came out in 2011. Can you tell us a little bit about what it's about and why you wrote it? Hasan: People are always asking me, as you did, 'What made you go into plumbing?' The main reason was because I wanted to be self-directing in my own life. I wanted to be self-employed. Also, plumbing is elemental. It is water. It's the stuff of life. So to me, becoming a plumber was symbolic as well as financially fulfilling, and fun, and great, and all of those things. It gave me much more than just 'doing the plumbing'. It gave me what I wanted in my life—which was that I could, when I was at the height my self-employed plumbing career, work as much as or as little as I wanted. I earned as much as I wanted. And I was a hero, so it was fulfilling me in more than one way. Commusoft: It's got more of a self-helpy vibe, doesn't it? Hasan: Yes. It is, really, because I felt the biggest thing that women lack is confidence, and I just wished that I could help them into believing in themselves more. Commusoft: I agree. I used to do a lot of teaching of writers who were mostly female, and believe it or not, it's the same thing—even though that is a women-dominated industry. The book sounds wonderful, and it mentions that the way businesses are run today suits women. Can you explain how that is? Hasan: Traditionally, it was dog-eat-dog. Back in the day when I was thinking about going into business, the books were full of things like 'Know your competitor, know how to outrun them, outsmart them, outsell them, out this, out that, and out the other.' Well, I really think that nowadays, in the days of social media, we're moving to a more collaborative style of business—and that really suits women. Commusoft: You also mention in the book that the bodies of females are perfect for plumbing, and we have to know more about that. Can you tell us more? Hasan: Well, we've got smaller bodies. Plumbing is so fiddly and we've got tiny, dainty little fingers, and they're not only for wiping baby's nose and embroidery. They're fantastic for getting into boilers. I've gotten myself completely underneath a bathtub. If you just look around your house at anything plumbing-related, you think, how on earth did anybody ever fit that? And how on earth will that ever be maintained? We are perfect for that. We're flexible, we can squeeze into little spaces. Commusoft: That's funny. Whenever you see a stock image of a plumber it's always a really big guy with half his body coming out from underneath the sink. Commusoft: We talked about how industry and big companies are already on board with hiring female plumbers. So, now, the big question is—why should more plumbing businesses hire women plumbers? Especially when we're talking about those one-man bands you mentioned earlier, where they don't really need a whole lot of people and they have a lot of people to choose from? Hasan: I think that having diversity in your workforce brings out the best in that workforce. I truly believe that. And I know that one-man bands are not going to change the industry, but because the majority of plumbers are one-man bands, it's like we're asking them to change culture—and they can't do it on their own. We really need larger companies to lead the way in changing that culture. We have some fantastic supporters, actually, amongst the one-man bands, I've got to say. We do have our fair share of trolling as well, I've got to say that too. There are some who are really against us. I don't know why they're against us. I mean, we're not really taking anything away from anybody. We're just supporting a group that's really underrepresented. Commusoft: I know we're running low on time, but can I ask one more question? You mentioned earlier that you want to solve the problems of the world when it comes to water, and to help get women on board with that. How's it been going? What have you been doing? Hasan: Some years ago, we formed a relationship with a community for children affected by AIDS who live in a rural area of Kenya, and they invited us to go over. We've wanted to go over for years and years and years. We went the year before last for a couple of weeks, and we helped them to build a rainwater harvesting system. In this area of Kenya, they do actually have six months of rain, but it splits up into two rainy seasons, one on either end of the year. They were not collecting the rain that was falling, so basically, when it stopped raining, they stopped having crops. I also created a teaching manual, having been a teacher, and I trained a young woman over there. We had women there who were taking part in doing the work as well. We managed to help that one community to collect 40,000 litres of rain, which they can use for irrigation purposes and grow crops. Commusoft: Are you going to be doing more of that in the future? Hasan: We really, really want to. Our focus just at the moment has come back to the franchise, and we need to build that. So that will come once we've built our profile enough so that we can afford to take some people away from their businesses. At the moment, a new franchisee just wants to build her business. She's not thinking about the wider world, although all of our franchisees know that one of the missions of Stopcocks is to support not only the next generation of women plumbers in this country, but also the empowerment of women in other countries. They were all on board with that, but—well, I've been doing this now for nearly 30 years, but many of them have only just started. So we're building up to that purpose. We're also collaborators with an organisation called Plumbers Without Borders. When a project comes and we can take part, believe me, we will. So, lots of things to think about and do. Commusoft: Before we wrap up, is there anything else you would like our listeners and readers to know? Hasan: I think anybody can do anything. If you want to be a plumber, you can be one. Don't let the naysayers keep you down. Every dream starts with the first step. Commusoft: Wonderful. Thank you so much. I really appreciate you being here. Hasan: Thank you very much.